For this swap you will have 4 partners. You will send each partner a store bought or handmade, Valentines Day card. They can be note cards, greeting cards, charity cards, store bought, or handmade. The ONLY 2 exceptions are that it can not be a postcard & it can not be one of those tiny classroom cards like students exchange at school. You need to actually write something inside & not just sign & send. Some examples would be to write some fun facts, jokes, recipe, poem, etc., or a mix of them all. Please FULLY decorate your envelope (front & back) in a nice Valentines Day theme using markers, paint, embellishments, stickers, washi tape or whatever else you like...it's your choice. 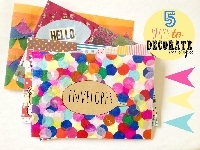 Here is a helpful link showing 5 ways how to decorate an envelope...CLICK HERE! Thanks for joining & Happy Valentines Day! I ended this swap on a Monday which I normally don't. Why? Because it's Monday (blah) & we are all just trying to start a new week out right so it's kind of an added pressure to worry about mailing your swap out on this day too. Therefore I extended the send by date to Wed.